« Do Footy Jumpers go on Holidays ? New AFL Football Team , Greater Western Sydney , join the national competition in 2012. A new Games Fixture has been set for season 2012 . The Grand Final , has returned to its traditional time , of the last Saturday in September . This will be 29 th September , in 2012 . Many will be pleased by this . The Victorian and Melbourne Racing Clubs , amateur AFL Football Leagues , MCG management , and Cricket Fans . 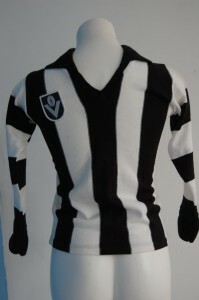 Loyal AFL Football Fans , who have adjusted their calendars to accommodate the October GF, will celebrate the return of the Grand Final to its traditional time slot by wearing their vintage football jumpers , jerseys , guernseys to the Game . This entry was posted on Thursday, October 20th, 2011 at 6:15 pm	and is filed under AFL, football jumpers, NRL. You can follow any responses to this entry through the RSS 2.0 feed. Both comments and pings are currently closed.